Since the holidays are so close, I’m considering penning a periodical for each holiday as they approach. Now, if you give this a small amount of forethought, you’ll immediately realize that there’s a problem. This problem, I have noticed, has become more prevalent the last twelve months. Cinema graphically: Christmas began in July on one network playing one Christmas based movie each weekend until the holiday is here. Commercially: Ads (although sparse) began in September. So, someone tell me; how do I disseminate my periodical on Halloween when dead, naked, frozen turkeys command the airways? By January 1st, we’re sick from the last three months, sick of the last three months and what have we accomplished? Allow me to tell you. We’ve upped our credit card debt; we’re bordering on morbid obesity; and we’re thirty percent dumber for doing this. One of my pet peeves is the statement, “Happy Holidays.” Where this came from, I’ve got a good idea but will keep my mouth shut. The correct term is, “Merry Christmas.” December 25th was set aside to celebrate the birth of our Savior, Jesus Christ. So, come on, folks, let’s call a spade a spade. I guess I’ll nix the idea of a holiday periodical. It would be too confusing during this time of year in which we attempt to cram tons upon tons of questionable choices into our already crowed lives. Maybe I’ll concentrate on the 4th of July, the birth of our nation, hot dogs, hamburgers and my favorite, sausages. Now, I’ve got a plan and I’ll begin with a grilled bratwurst and a half a dozen sparklers. I have a friend who’s been after me to write a children’s Christmas story… I don’t know. Most of my characters have unusual attributes that wouldn’t easily lend themselves to a children’s story. Maybe if that child were the spawn of two maniacal beings? For this particular friend (who happens to be one of my best buds) I will give it a try, but I ain’t sure she’s gonna like it. While we’re on the subject of Christmas… are you ready? 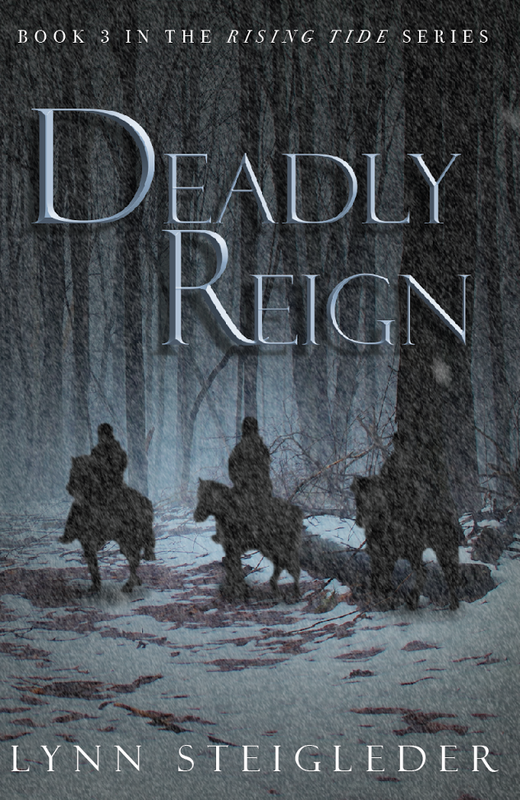 We’re only about 2 ½ weeks away… Well, of course, you’re not. Are you making that large four-wheel purchase this year or possibly surprising that special someone with that ring finger rock that signals future nuptials? Just remember, that diamond you’re encouraged to pay three months’ salary for is worth about a dime-a-dozen. The diamond industry is so regulated that they can turn a common gemstone into a rare commodity. Bash the bottom out of an old soft drink bottle. Shape the selected piece on a grinder. Polish alternatingly with finer grits of emery cloth until the desired sheen is achieved. Cut a piece of pipe corresponding to the size of the intended’s left ring finger (this may be taken from any type of tubing, copper, brass, etc). Marketing, marketing, marketing. I need to get a diamond marketing executive working on my book. Each piece of literature will come with a one-of-a-kind engagement ring of my design. I already have the slogan, “Every lick begins with Lynn.” …Nuff said. Certainly, you have your decorating complete by now. Your Christmas tree trimmed and flashing in chorus with a massive display of exterior illumination. Together, they transmit a beacon to surrounding counties alerting them to your holiday presence. I remember one year stringing thousands upon thousands of lights. My front yard looked like a passel of demented one legged spiders had descended, attempting to spin one bad web between them. Needless to say, they failed miserably. I believe it was around Easter before the lights were down and tucked away. Once again…nuff said. Stockings on the mantle, Nutcrackers line the shelves, representations of practically every Santa Claus around the world and a few off planet variations arespread about the house. A Christmas village fills the entire fireplace hearth. Ceramic houses, angel hair snow, and pine trees add color to the white landscape. 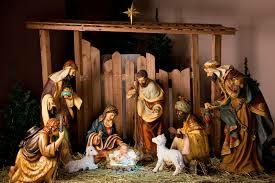 A large nativity scene outside and several smaller ones inside our home depict the very beginnings of a Gift. A Gift that would endure the cross, conquer the grave, and span the ages. If you had your “drathers,” would you catch a ride on the space shuttle, journey to the deepest spot in the ocean, or write a novel? We are all too familiar with the dangers affiliated with space flight. Apollo One saw three astronauts, Ed White, Gus Grissom, and Roger Chaffee, lose their lives in a freak accident on the launch pad. 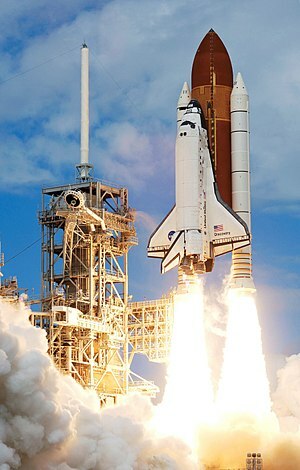 Then, in 1986, the Challenger Space Shuttle exploded shortly after takeoff, killing all aboard, and the crew of the Columbia was lost on reentry, in 2003. Thousands of souls have been lost in maritime disasters; however, one crowning moment was achieved in 1960 and has not been duplicated since–an excursion to the deepest point in the ocean by Challenger Deep. The walls of the vehicle were five inches thick with plexiglass view ports, one of which cracked near the ocean floor emanating an alarming thud and sending a vibration through the sub. The trip itself plunged to a depth of nearly 7 miles. Not being an adrenaline junkie or inquisitive enough to explore the depths of space or the depths of the oceans, I would choose to write a novel. In fact, I’ve managed to write several. They all seem to contain elements of danger, be it of the natural or supernatural varieties. If I look closely enough, I can usually detect a small part of myself somewhere within the menagerie of personalities. I guess I’ll live vicariously through my characters as far as danger is concerned… 0n second thought, that statement is more than likely false, as I have no desire to indulge in risky activities. Do you see how I can confound the sanest of people, while keeping myself in a total state of confusion? As I take a few seconds to beat the cobwebs out, I’ll attempt to continue this post in some coherent fashion. I consider this to be my Christmas post. I know it may seem a bit odd to associate such a joy-filled holiday with so many instances of tragedy and man-made disaster. However, I think it accomplishes two things. In many ways, it showcases our best–that unwavering human spirit, undaunted even in the face of certain demise. It is this spirit that has given us our many freedoms, medical advances, and countless discoveries that have made the world a better place. Secondly, it should keep us mindful of the sacrifices made and the families left behind. It is impossible to name all of these hero’s, though it is possible to remember all concerned, not just this time of year, but each day that we ourselves awake. Finally, have a grand time with family and friends this year. Take care and be safe in your travels. And no matter what this new year brings, take solace. The one who came 2000 years ago to save, well… He’s still got your back! I’d like to start by saying happy birthday to Jesus, merry Christmas, and may we all have a happy new year. Secondly, I thought that since we’re in the midst of the holidays, we could illuminate a few Christmas traditions. Let’s begin with Santa. 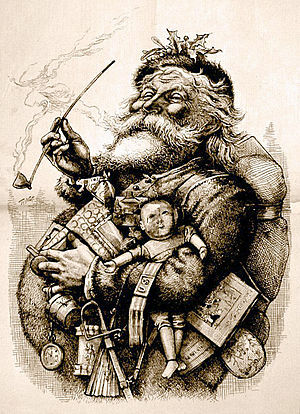 The physical appearance of the modern day Santa was created by artist Thomas Nast in 1881, based on the famous poem “Twas The Night Before Christmas.” The image of Santa is said to have also been influenced by the Norse God Odin, a large, bearded man who rode Sleipner, an eight-legged horse. The historical Santa, on the other hand, is actually based on Saint Nicholas, a 4th century Greek saint who was known for distributing small gifts to the people he encountered. The reindeer don’t appear in any historical texts until the aforementioned poem “Twas the Night Before Christmas.” Many people don’t know (actually, only I do) that the back-up reindeer are named Marvin, Bob, Zippy, Dave and Ajax. True story. Next we’ll discuss the Christmas Tree. Evergreen trees have been important to many cultures, including the Chinese and the Hebrews. The tree as we know it today originated in Northern Germany. The tree was decorated with fruits and other foods, including dates and pretzels. Many times, these trees would be erected in the town square in order to provide the frigid folk something to dance around. Finally, there’s the stocking. This originated when children filled their boots with straw and sugar and placed them near the chimney for Sleipner to eat (Remember Odin’s ride?). To reward their kindness, Odin would replace the contents of the boot with gifts. Soon, this tradition merged with that of Saint Nicholas. I hope you’ve enjoyed this excursion through a few our most familiar Christmas traditions. I can hardly wait for Christmas Day. 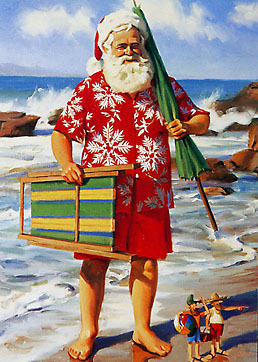 This year, Santa’s gonna bring me some new ideas to replace my worn-out old ones.